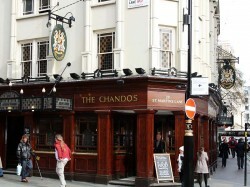 Popular two-floored pub at the north side of Trafalgar Square. The downstairs bar is wooden floored and mainly standing but with small booths along the wall. Upstairs, it’s much more homely with carpets and even some leather sofas to lounge on. Sam Smith’s pub – so cheap rounds. And they do still have the cask bitter which not all Sam Smiths pubs carry now.